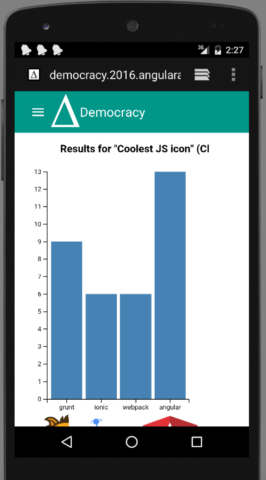 DEMOCRACY project is the world's first open source "Voting" portal. Easier and faster resolution of team decisions. Happier teams/communities as every one is heard. Direct democracy in any organization/team/state will generate better and well rounded ideas, vs top down hierarchies. You dont have to rely on third party websites to create your polls. Just download and setup your voting portal. Project "DEMOCRACY" is flat by design. What that means, is that no one has extra privileges like "admin", "poll creator" etc... There is only one role in project "DEMOCRACY", and that is a voter role. Since project democracy is just a client side project, with the entire data stored in Firebase, there is no scope for corruption. Firebase rules ensure that no one can rig the vote. As voter people inside a team can login and vote. just to clarify the site is just a demo. I am trying to make a open source voting framework , which will be used by every group of people in the world for their decisions. They will not use this site, but use this framework to setup their own site. But the votes seems to be computed more than one time. there is a bug, if that happens u can refresh the screen, i cant fix it any more since the code window is closed. thanks Nathan , loved ur app too!!! I really liket the idea a single page with easy steps ! For two days it looks really amazing, well done! Good effort. Just a little too much setup work for the user. thanks HomelyHyperion . the setup that is required for the team is download from git and set it up with firebase. I agree this will not be easy for non tech people. I wanted to make that easy, going forward. This is just starting the open source effort. I would appreciate if you all developers, help me by sending pull requests, and making democracy for all a reality. Site crashed my chrometab when trying to view results after clicking around a bit. It's good that I cannot change my vote after seeing the results, but I think it should probably be a setting when creating the vote, since I can see usecases for both options. Gustav if u face any issues, you can refresh the page for now. As i am using the alpha version of angularfire, there are still many issues in the software. If you want to have the ability to change your vote, you will have to create a poll which is not immediate, but has a end date. You can can change your vote till the end date. yeah refresh if that happens. there are still some bugs which need some work. The concept is great. The platform would be really useful to team decisions. Very well done material design. Must have been a lot of work for one person to pull of. I appreciate you liked it. this will be a open source project. It looks and feels amazing. I have already seen some team based voting solutions but this one seems to be really good as well. Looking forward to see what you meke out of it. Could become a very powerful independent tool. But if I understood it correctly you still rely on having your data hosted on firebase. Are there plans to support other db's? Lasse you are correct, i am right now relying entirely on Firebase. The advantage of firebase is that i don't need a node/php/ruby/java backend any more. The entire project is just UI. this helps with hosting as static hosting is mostly free. If i use other DBs, hosting costs starts to increase. But i would love to hear more from awesome developers like you. lets collaborate and make this project a reality!! I would love to, if I can find the time. Looks good but app freezes on the results page because of some issue and makes my chrome crash. hi mattj thanks for your feedback. I found out why the site crashed on changing tabs. let me know if u have any other comments/suggestions. this is going to be a opensource project, always looking for contribution from awesome developers like you . This is a really nice polling system and could definitely be useful within teams. I like the design and being able to associate images with poll options. The graphs are nice, and the UI is cleanly designed and works fluidly. There's some issues where the app crashes, and it makes an awful lot of requests; I assume some of this could be fixed with app bundling and other bug fixes. From Slack it's clear that you're aware of the bugs; all in the fun of a hackathon! These issues don't take away at all from your impressive achievement. This is a complex app, especially for 48 hours and a single developer. Especially impressed at implementing Google Plus sign-in. Well done on a great achievement. Effective layout, good use of Angular material components (props for angular/material2 alpha), and D3 viz is a nice touch. Primary workflows are stable and work as described. Very cool to see practical application done in Angular 2, material, RxJS. Good work. I love your app. it's useful..
Good idea, maybe add some styling customizability? yeah i saw that as well before starting on this. i found the framework to be very cumbersome and time taking. Thats why i wanted to keep DEMOCRACY completely in UI stack. I want it to be super easy for people to implement. With the new release of firebase yesterday, i can even do the only thing that was missing, "notifications". 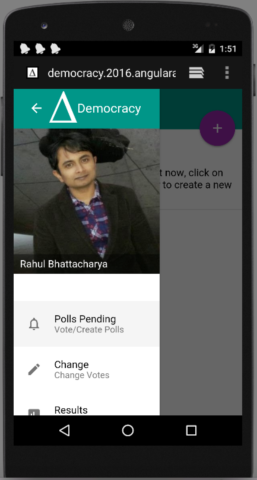 After the competition is over, i will move it to new firebase and DEMOCRACY will have notifications too. It looks good. I see minor problem with avatar's images. There are a little bit stretched vertically. Most complete idea thus far, I love the fact that you kept everything for display for all, created this social itch to want to be part of it. The fact that you confined the choices to two (or that's what it looked like) made it so much faster and easier to use. Great job. Thanks ayyash ,glad u liked it. Also we need minimum 2 choices, for a binary poll. You can have more than 2 options by clicking on + button. thanks ayyash, i am always looking for contribution from awesome developers like you. let me know any suggestions or code changes. i hope democracy for all becomes a reality. Really good, but why do I need to create a poll in order to see the active polls? Love the "Reason feature"
polls crashed my chrome browser. Nice UI. But concept is vary common. Very good tool for voting. My only problem was that I can't review my votes for the polls I completed. hi vanti1980 glad u liked it. while creating a poll u can create it as immediate or with end date. The immediate one shows u results immediately and u cant change. The end date one u can change till the end date, when the results are announced. Awesome looking UI / good use of Material Design. Neat concept! Liked the new Material Design. I can use this to have polls with my friends. thanks yk2081, glad u liked it. It works and looks good. This could prove to be very useful! Great app and idea! Very nice idea, athough a bit hard to setup. The design could use some work though, but overral, a great idea, it could become something big easily! It is a great project, sometimes a little bit unresponsive but I like the UI. I am not sure about how useful it can be, it seems like an advanced poll system to me. Great work in so little time. Hi ahamed thanks for the feedback. This is just the beginning of the project and whatever I could do in 48 hours. I appreciate any suggestions/pr . It will have a search filter down the line. I will implement that once the dust settles. Finding different ways to achieve democracy is always a plus in our world. In terms if the project its amazing how much was done in so short time. thanks Andre, glad you liked it. This project will be an open source effort. Any contributions from awesome developers like you is highly appreciated. great app and awesome idea! keep it up! Useful. Simple Design. Not a fresh idea though but neat execution. All the best. hi Ind, thanks for the feedback. before making this, i scoured the net for team voting solutions. The voting solutions are all third party websites, which lack one thing or the the other. What will be different about this, is that teams can download it and easily set it up with firebase. Once done they can do whatever customizations they need. Also having no backend , provides the flexibility of using any static hosting . Nice idea. Decent design. Form widgets needs improvement for mobile device. Browser default html 5 validation pop ups & overlapping inputs are distracting the user from enjoying the cool features of a cool app. Very useful app, great job for a such short time. It would be good to have additional authorization methods here. Apps look good, But it hangs my browser! I have mentioned the bug in my description. Okay Rahul..Sure! Nice Work BTW! Cool app! useful and functional as advertised. This would have been useful for our planning stages for this hackathon. A lot of work has been done on only 2 days, it feels like the project could be used as it is, so kudos for achieving your goal here (I gave a bonus point in utility for that, because I feel like it is useful right now, even if it's still a little rough). Nice UI/UX and pretty unique Idea. I love the idea and it seems you've put a lot of effort to create a product which aims to make a difference. It is going to be tricky to ensure uniqueness of the votes for sensitive polls. I'd also suggest improvements in the user experience, optimization of the initial load time, lighter images, (why not) service workers for caching of static assets.